Intellizoom is a subsidiary of a larger company called Userzoom. They help software designers and webmasters test the quality of their product interfaces, with the end-goal of improving and refining the user experience. A big part of their work involves recruiting and paying people to perform hands-on tests of websites, smartphone apps, and computer programs. During the tests they gather data which the client company's can use to make tweaks to their products. The testers are called “panel members” and the actual tests are called “studies.” Panel members get paid a small fee for each study they participate in. How Do Intellizoom Studies Work? Before you become an Intellizoom panel member and gain access to paid studies, you'll have to successfully complete two practice studies to prove you know what you're doing. Then you must create a user profile that includes a great deal of personal demographics information. They want to know quite a few private details, but they promise to keep this information confidential, and insist they'll only use it to determine what studies you qualify for. The work itself involves using apps or websites while being monitored via webcam. In some cases you may be asked to simultaneously answer certain questions, or think out loud about what you're doing. According to the hiring website, some of Intellizoom's studies are a bit simpler in design – they don't involve recording any audio or webcam video – and these have a lower pay rate. The average time to complete a study is apparently 10 to 20 minutes. You'll get notified via email when you qualify to participate, but you have to be quick on the trigger, because according to everything I've read the studies are first come first serve opportunities, and sometimes they don't last very long. The good news is that Intellizoom pays pretty well, especially considering the amount of time the work takes. You get a flat rate of $10.00 for the more complicated studies, and $5.00 for the simple ones. For 10 to 20 minutes of work, that's a pretty good deal. The bad news is that the opportunities to participate are somewhat limited. You'll only get invited to studies where your demographics information is a match for what the client company is looking for. More experienced panel members with a history of reliability are apparently given some degree of preference, and certain people will get more invites than others because they fit into one of the heavily targeted demographics niches. But even so, it's probably best to look at Intellizoom as an occasional opportunity to make a few extra dollars rather than a primary source of income. How Do You Get Paid for Intelizoom Studies? Payments are issued exclusively via Paypal, and the money goes out 21 days after a study is completed. There's also a grading process, and if you don't do everything properly you won't get paid, so pay close attention to the finer details in your instructions. Applicants must be residents of the US or UK, 18 years or older, with a desktop computer, a tablet or smartphone, a quiet place to work, a good internet connection, and wifi access. You'll need to buy a webcam and a microphone if your computer doesn't already have them, and you'll also have to install some special software before you begin working. What do People Say About Intellizoom? I spent some time browsing the web, looking for opinions on the company. Most of the comments I found were very positive. Panel members get paid for their participation, and are generally treated fairly. Folks who've done this kind of work before seem to mostly agree that Intellizoom is comparable to a lot of the other legitimate usability testing sites. They're not necessarily any better than the rest, but not worse either. The primary complaints were about the lack of steady work. Some people only get invited to do new studies once every two months or so. Others seem to get two or three invites a month, but I didn’t see anybody claiming to make a really large amount of money. 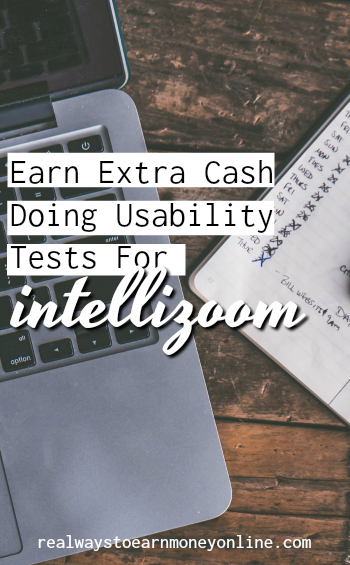 If becoming an Intellizoom usability tester sounds like something you'd be interested in trying, and if you meet all the requirements, go here to read more about the company and submit an application.